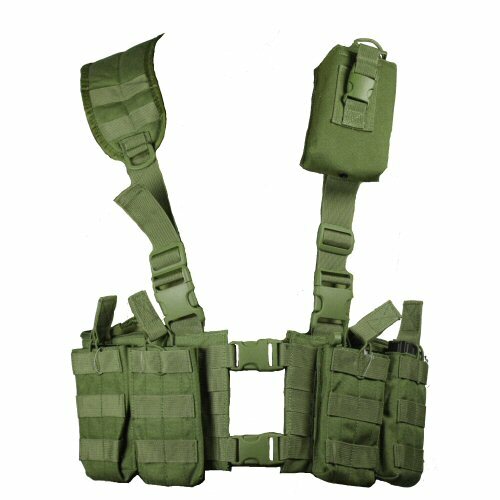 An Olive Drab lightweight rig to incorporate loads of magazine storage in a compact space, the lightweight NATO M4 MOLLE vest is a skeletal design based on the MLE adjustable yoke and cummerbund system, with four detachable, additional single M4 magazine pouches, radio pouch and hydration carrier on rear. Additional carriage space is provided on the rig itself with six magazine pockets and two zip pockets located in the cummerbund. The rig is highly adjustable for size, with extra strapping to allow the cummerbund sections to be worn as a chest rig without the yoke. The rig can be symmetrically laid out for best distribution of weight, but all the additional pouches can be removed and replaced as the entire system is MOLLE based. Incorporating a hydration carrier on the rear gives the wearer real longevity on the field with constant hydration. 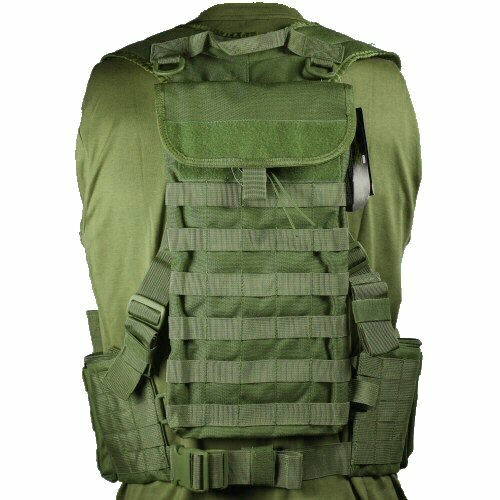 Ideal vest for hot weather and use in tight spaces. Buckles are from the Duraflex military Stealth warrior range, 1000D PU coated Cordura for durability. The rear of the rig has a removable hydration carrier.